Artists are losing out on an opportunity to engage with their fans during the show. Artists can engage their fans for a better concert experience and create new ways to market to them with their partners. Created a real-time, server-less web app that allows fans to vote on what songs they want to hear at live shows. This creates a new opportunity to engage with fans during the show, all while logging important set list data as the artist commits to playing songs. 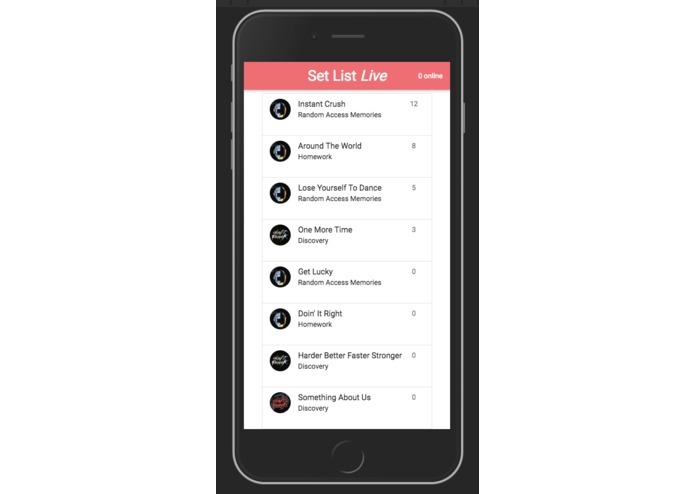 To help artists market, we created an API that generates social media images for set lists and creates Spotify play lists from set lists so they can distribute these after the concert to enhance the "After-Show Experience". Would love to finish the Socan API!!! I have it setup but I'm getting error codes from their API. It'd be a great addition to have artists be able to directly send their set list data to Socan!! !